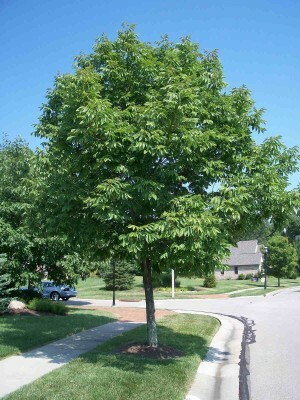 Note: Maple trees are not being recommended for street planting at this time in an effort to diversify the current tree canopy in Winterset. No tree may be planted which would cause a public danger or nuisance. No tree may be planted within three feet of a sidewalk or other impervious surface such as the curb and gutter or the street surface. No tree or shrub that will grow above 30 inches in height shall be planted on a corner lot where two street intersect for a distance of 35 feet in any direction from the point of intersection at the curb line. No tree shall be planted within 15 lateral feet of an overhead utility line, within 3 feet of any buried utility line, within 10 feet of a fire hydrant, within 5 feet of a driveway and 25 feet of a traffic control sign. No tree shall be planted if the tree species is not included on the list of permitted tree species developed by the Winterset Tree Commission. No tree shall be planted without first calling Iowa One Call and complying with the procedures for locating underground utilities. In cases of damage to utility lines, any street tree planted in the right-of-way may be trimmed or removed in order to repair the utility line. 1. How do I identify an Ash Tree? b. Another resource is the Madison County ISU Extension office, asking for a Master Gardener for assistance. 2. How do I identify an infected tree with Emerald Ash Borer? We recommend using such tools located on websites ISU Forestry; ISU Master Gardener; and DNR (See links below). a. Contact a profession Arborist and ISU Forestry Department professional. The local extension office or the ISU Extension website has contacts listed. 3. How do I dispose of infected wood in Madison County? Currently the option is to dispose of the wood at the county landfill. The Tree Commission is working on additional options, so watch for updates to this document. In addition connect to the DNR link. There are instructions listed on reporting. a. See links: Iowa DNR, Emerald Ash Borer and Iowa DNR, Why Plant Iowa Native Grown Trees? 4. What are treatment options for Emerald Ash Borer infected trees? 5. Is there a city ordinance for Dead Trees in Winterset? At this time Winterset does not have a city ordinance to guide the city’s dead tree removal. However, the Tree Commission is working to recommend an ordinance presently. So be sure to check for updates to the Q&A document. ISU Forestry Department and the Arbor Foundation have a sample ordinance to guide the commission. 6. What would be a good replacement tree? 7. Who do I contact for more information related to Tree Commission Community Preparedness activities? We suggest you contact John Pletchette at City Hall or attend monthly Tree Commission Meeting. 8. What resources are available to have an infected or dead tree remove in Winterset? If you have additional questions, click here to email Pam Deichmann.